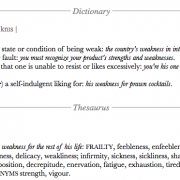 CAN ACCEPTING A WEAKNESS BE BENEFICIAL? the state or condition of being weak. When such definitions and synonyms are combined with a western puritan work ethic, there is little wonder why our culture and society views weakness – and in particular admitting we have any – with such negativity. In many areas of our lives weakness it is seen as, quite simply, unacceptable. No where is this more pronounced than in the world of business where accepting weakness is often regarded as kryptonite. Ours is a ‘can do’ society where individuals ‘in control’, or those who make things happen, especially in the teeth of a storm, are greatly admired. A problem we face is that we pften fear our weaknesses and seek to keep them hidden – sometimes even from ourselves. Such negativity thrives in the dark corners of our consciousness and if left to its own devices it festers and grows. Many believe that if they admit to a weakness they will be judged and criticised by their peers (as if those same peers do not possess weaknesses themselves). The internal corrosion of fear and self-judgment, and the stress and anxiety it creates, is not only damaging to our health, but is also completely unnecessary. The acceptance of weakness has to be clearly defined. Surely we all accept the fact that we are not going to be good at everything. Our abilities, our thoughts and actions, all have their ups and downs. Weak points are inevitable, but accepting that fact does not mean we are giving in to, or indulging, a flaw – it is a simple matter of reality and the sooner we grasp that fact the sooner we can get on and do something about it. In businesses one so often hears military and sporting metaphors being used, but many ignore an attitude to weakness prevalent in elite sport and the military: they ignore it at their peril. They may wish to conceal any weaknesses from a tactical point of view, but behind the scenes their attitude to weakness is realistic, pragmatic with a very practical and up-beat outlook. Whether weaknesses are neutralised, contained, or even removed altogether, we can then concentrate on the game winner: playing to our strengths. sooner or later, they WILL manage us. We hone our strengths and seek to perfect them as they are our vanguard in life. But improving a weakness, even by a few points can raise our whole performance right across the board. http://keysforliving.co.uk/wp-content/uploads/2014/03/Screen-Shot-2014-03-06-at-13.58.38-e1394114691223.png 241 674 Alan Keyse http://keysforliving.co.uk/wp-content/uploads/2014/01/logo_top_old.png Alan Keyse2014-02-06 14:02:222014-03-07 11:55:33CAN ACCEPTING A WEAKNESS BE BENEFICIAL?